Following a number of leaks, including footage spilled from the tutorial, EA has finally given us a close look at exactly what is involved in Battlefield V’s battle royale mode, courtesy of a three-minute official gameplay trailer. Firestorm, as the mode is called, puts some new tricks into the battle royale mix – though as we’ve previously noted, it copies much of the traditional formula, including taking some inspiration from EA’s current hit Apex Legends. Some of the interesting stuff highlighted includes the destructible buildings: there’s no need to draw a bead on that sniper in a window, when you can simply take out the entire upper floor of the house with a rocket launcher. Or blow the whole thing up with a tank. Indeed, the eponymous Firestorm – the encroaching ring of fire that herds players ever-closer together – also razes buildings to the ground as it rampages onwards, and it looks like a truly scary gameplay mechanic in terms of the damage it doles out. The trailer also shows that players need to work together to access lock-ups, which is where the rarest land vehicles reside, and there will be 17 vehicles in Firestorm to begin with. That includes a prototype helicopter and a shiny red tractor which can apparently pull a rather dangerous looking piece of artillery. Some of the best loot will be hidden in safes that need to be cracked, and rare or epic gear will also be obtainable by completing resupply point objectives (which won’t be an easy task, the narrator reminds us). And as we saw previously, characters get ‘downed’ and can crawl around with a chance to be revived as in Apex Legends, except Battlefield V allows you to shoot a pistol while you’re prone on the floor, to give you at least some kind of defense as you slowly bleed out. Also noteworthy is the sheer size of the single map, which is no less than 10 times the size of the largest map in Battlefield V (Hamada), giving players a massive sandbox to scrap in. 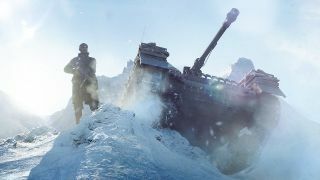 Firestorm goes live for Battlefield V addicts on March 25, so the start of next week, and it’ll definitely be interesting to see what reception it gets, particularly in the light of EA’s recent success with Apex Legends. We're also looking forward to seeing whether the hype machine of Apex Legends, which seems unstoppable given the sheer amount of players that have initially been drawn to Respawn’s free-to-play squad-based battle royale outing, will interfere with just how raging a success Firestorm will be.